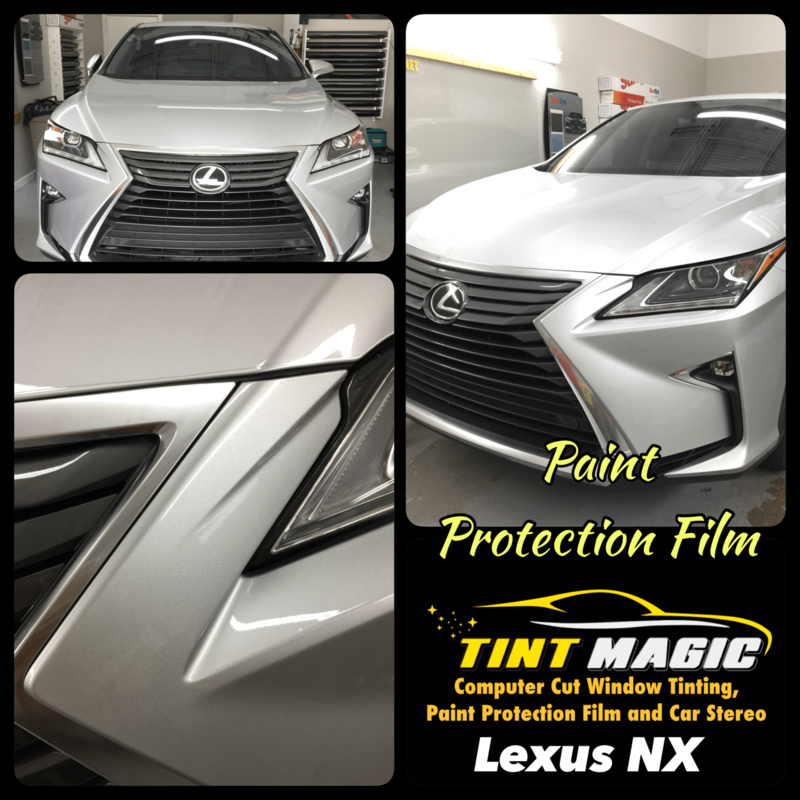 Lexus NX Paint Protection Film -Clear Bra at Tint Magic Window Tinting Coral Springs. We have applied Paint Protection Film (PPF)- Clear Bra over bumper partial hood, fenders and mirrors. Call us for the best quality and service! (954)840-7883. We are located at 11344 Wiles Road coral Springs, Fl 33076. The NX wants to be a sports car—you can tell by its chiseled body and angle-eyed glare—but don’t be fooled: underneath it’s a softy. F Sport models get a stiffer suspension, but that fails to truly sharpen the handling. A 235-hp turbo 2.0-liter inline-four and six-speed automatic are standard; the available hybrid returned just 27 mpg in our testing. Front-wheel drive is standard on both models; all-wheel drive is optional. A well-appointed cabin and comfy seats keep the NX in the hunt. t’s strong enough to tow up to 6,200 pounds1 with the 3.5L Pentastar® V6 engine and up to 7,400 pounds1 with the available 5.7L HEMI® V8 engine. If you want technology, it’s got you covered. At your fingertips is an available Uconnect® 8.4 touchscreen system2that packs a punch with state-of-the-art features. With optional seating for seven and a dual-screen Blu-ray Entertainment System, you’ll have plenty of room for friends, family and options to make sure they enjoy every drive more than ever. If you didn’t like the NX’s polarizing face before, you probably won’t like its new one, which keeps the large spindle grille and the sharply creased headlights. There are a few new air intakes up front, along with new wheel designs, slightly thinner taillights, and a reshaped rear bumper. An F Sport option package is again available; it turns up the aggression with its black mesh grille and different wheels. Interior upgrades are subtle and include a new metallic finish for several buttons, knobs, and redesigned HVAC controls. A larger, 10.3-inch central display screen is newly optional; it is controlled by a revised remote touchpad that we hope will improve upon the current model’s frustrating interface. A foot-motion sensor to open the power tailgate has been added to the available features.